يوفر فندق منتجع نوفوتيل كيرنز أواسيس ظروف إقامة راقية وهو خيار رائج للسياح ولرجال الأعمال أيضاً. يقع في منطقة سياحة, مطاعم, شواطئ من كيرنز. يقع مركز المدينة المثير على بعد 1 km فقط. سوف يعشق النزلاء موقع هذا الفندق، فهو قريب من أهم المعالم السياحية في المدينة كمثل Cairns Skin Cancer Clinic, St Monicas Cathedral, Centre of Contemporary Arts . يقدم منتجع نوفوتيل كيرنز أواسيس خدمات لا غبار عليها وكل أشكال اللياقة وحسن الضيافة اللازمة لإسعاد ضيوفه. يقدم الفندق خدمة الغرف على مدار الساعة, واي فاي مجاني في جميع الغرف, خدمة التنظيف يوميًا, مكتب الاستقبال على مدار الساعة, مرافق مخصصة لذوي الاحتياجات الخاصة لضمان الراحة القصوى لضيوفه. ادخل إلى واحدة من الغرف 314 وتخلص من عناء نهار طويل بمساعدة مجموعة كبيرة من الخدمات كمثل تلفزيون بشاشة مسطحة, اتصال لاسلكي بالإنترنت, غرف لغير المدخنين, مكيف هواء, تدفئة الموجودة في بعض الغرف. سواء كنت من محبي الرياضة أو كنت تتطلع لتفريغ عناء نهار صعب، ستجد خدمات ذات مستوى عالي بانتظارك كمثل مركز للياقة البدنية, حمام سباحة خارجي, تدليك, مسبح (للأطفال), بلياردو. إن منتجع نوفوتيل كيرنز أواسيس هو مكان مثالي للمسافرين الذين يتطلعون إلى الراحة والاستجمام في كيرنز. Location is pretty central to the restaurants, shops and waterfront. Loved the pool with its sand. Gets a little busy in the evenings and they seem to run out of towels. Going for a morning swim before everyone arrives was wonderful. Did not eat there, but restaurant looks nice. The in room meals are rubbish. Was not impressed with the selection and the taste,especially after 10 pm meals. Also no drinks in fridge or courtesy water absolute joke. No USB points to charge stuff in some rooms. No menus very all over the place this hotel is. Great hotel for a holiday. Stayed fr 4 nites and had early check in. Staff and services excellent. Location wise is good. Within walking distance to the explanade. Plenty of restaurants and all are within walking distance. Tour desk lady , Ruby , excellent service and very helpful. The hotel pool really nice , very resort orientated. Will come back to stay. Despite the message on their website stating that renovations will commence mid October, we arrived in late September and found their renovations were well underway. There was no restaurant, bars or chill out areas in the hotel. Renovations commenced at 6.45am each weekday, despite signs in the foyer stating that work will be conducted between 9am and 5pm. Jackhammering, grinding and banging, causing vibrations through the walls was regular occurrence well before daylight. Sadly, the staff failed to police the tradesman commencement times and allowed them to perform work before their scheduled time. My opinion is that Novotel/ACCOR value their profitability over the satisfaction of their guests. Enjoyed every moment spent here at the Oasis Resort & YES we will definitely be back for the 3rd time :-) Recommended to all - Families, Couples, Older, disabled - Caters for all !.. Conveniently located to the Airport & walk to the city centre or Esplanade. The hotel staff in general was very helpful.The pool was great and the room.feeling comfortable. We stayed here for five days.The pool was great, and watching the flying foxes leave the city from the pool was just cool.The room was really nice, very clean, and very air conditioned, which was very necessary. Bad things is our room card always cannot open the door.And some of people smoke at the pool side. While the rooms are a bit dated and I think pending renovation, the fasciitis were really great! Good stay for kids. Swimming pool is kids friendly. Easy access from our room. Few mins walk to the city. The resort is under renovation. Didn’t bother us so much as we were mostly away from our rooms. Resorts just needs more facilities ready available for guest, need better selections for breakfast. Dinner menus could be better. Paying a bit more per night, resort can atleast provide a bottle of water everyday, especially during hot weather. Overall, A good stay. Good location to the waterfront. Nice spacious room. Thank you for your review Jee! Holly made my daughter’s birthday weekend extra special by sending up a card and cake for our arrival at the resort. Although this resort could do with a facelift it is clean, has great facilities and is in a great location. I was sceptical about my stay here with my daughter as I read some other reviews however, after expressing my concerns to management, they provided us with a lovely room located in a quiet spot overlooking the pool. I would return to this resort without a doubt, but would like to see the pool bar open longer hours. As for the bats, this is not a resort issue it’s a council issue. Thank you again for a lovely stay. Positives: The best location with an awesome sandy beach pool. Fairly standard breakfast with nice staff Negatives: Our room could do with new paint on the wall with added artwork also the carpet needs replacement throughout the resort. We believe this resort maybe when new was 4 star but now should be a solid 3 star as it is dating in the bathrooms mostly with shower over bath with shower curtains. 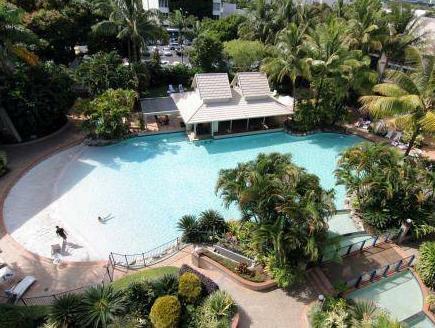 Love the resort feeling of Novotel Oasis Cairns. 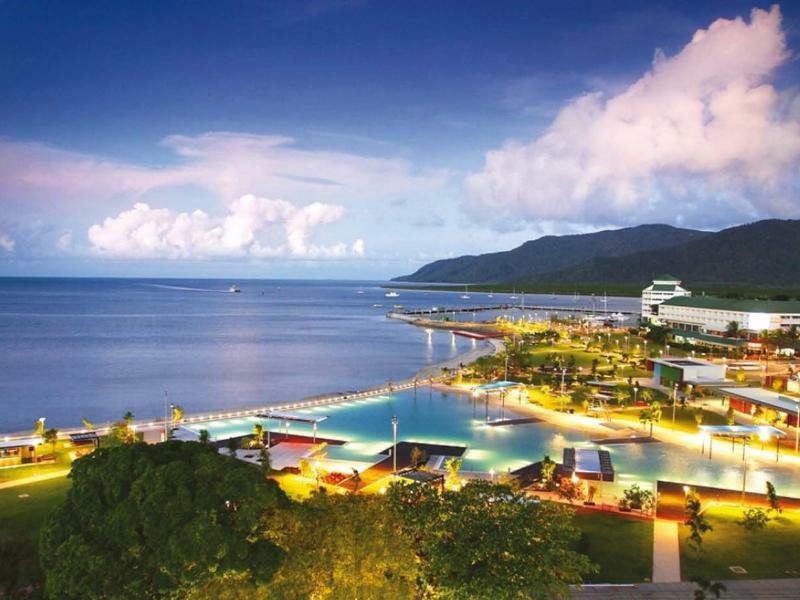 We always love staying at the Novotel when we visit Cairns. Staff are efficient and welcoming. Rooms are nice and love the new menu of being able to choose a pillow of choice. The buffet breakfast is sensational with lots of fresh fruit and freshly cooked hot food. Loved the smoothies. Thankyou for a wonderful stay, yet again. About the bath tube of photos from agoda,its different with when i checked in. And staff at the reception ...maybe he is too buay, so not really friendly,no smile. No wifi. Breakfast was nice, but room service dinner meun ,can put some photos on ? It will be more clear ! Otherwise It was almost wonderful experience stay in Novotel ! Loved that room service came at such an affordable price (hotels usually overprice their food), and the menu included a range of delicious items. Room was spacious, clean, tidy, which were a big plus! We had such a great time and will definitely come back to Novotel if we head back to Cairns again! The only thing was food/dining: I ordered roasted tomatoes and mushrooms on toast (which the menu said would come with sourdough bread), but it was really just two white sandwich breads. Staff were friendly and welcoming too, except for one lady who didn't try helping us open a wine bottle when we asked her for help. She might be having a bad day, but still, no excuse! Other than that, excellent! :) Thanks Novotel. Overall the hotel was brilliant, perfect location, the rooms were great and spotless, the breakfast was a lot better than most hotels. There was a lot of children around the pool so not the best for groups of people. The pool bar was supposed to be open until 5pm but closed at 3pm if there was not many people, which was a bit unfair on the people that were there, it also ran out of certain drinks which they didn't replenish for the rest of our stay, we were told to go in the hotel bar instead. Apart from that no complaints really.